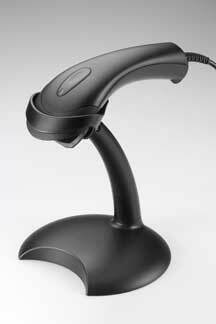 · Medium Range Read Distance up to 6"
The Model AS8005 scanner is designed for Office or Point of Sale use. The AS8005 is only available with a USB Connection. Barcode data read by the scanner appears as though it were typed on the keyboard. The AS8005 connects to a USB port on newer PCs and laptop computers. The AS8005 is used to add a barcode "front end" to existing applications. If these applications normally accept input from the keyboard, this scanner enables use of barcodes without any software modification. Data from the scanned barcodes appears as though it was entered on the keyboard. The AS8005 can be used on either PCs or MACs. Configuration: Via Scanning Barcode Menus. Complete CD Manual provided. Barcodes Read: EAN/UPC (including supplements), Code 39, 2 of 5 Code (Including industrial, matrix and DataLogic.) Codabar, Code 128, Code 11, Code 93, and MSI/Plessey. Connectors:The AS8005 comes with a standard Type A connector. Cable:The AS8005 comes with a six foot cable. Power:The power is provided by the USB connection. No seperate power supply is required.